Bappa Rawal is known as Maharaja of Mewar. Bappa Rawal was the 8th century brave ruler of the Mewar region in Rajasthan, India. He was a member of the Guhila (Gahlot) clan of Rajputs, and the founder of his dynasty. Historians have identified him as a ruler of the Guhila dynasty, including Kalabhoja, Shiladitya, and Khumana. He did great works for Bharat and its people. He is better known among Hindus as a Vijayi Raja for his bravery against enemies, he never lost any battle against them. During his reign he also diffused invasion of Mlecchas (anti-Vedic arabs) around 725 CE protecting Chittor and hoisting Saffron flag all over fort. 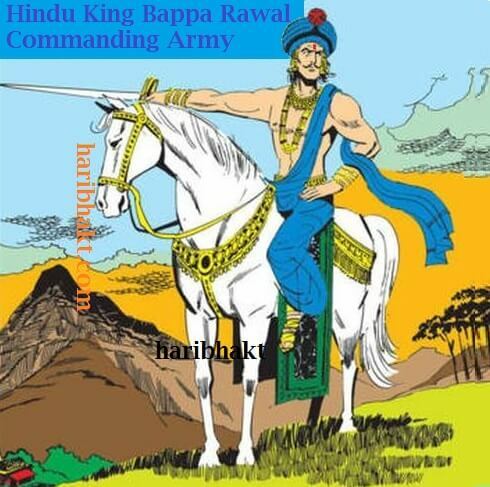 Bappa Rawal fought a series of war against enemies to protect his Hindu state. The war was fought between the regions of North-Western Bharat and Sindh. He was inspirational king even among the rulers who were ruling nearby states. To substantiate the opulence of kingdom, he also released gold coin featuring Shri Vopparaja, with the images of a bull, a trident, a shivlinga, and an attendant. The other side features a cow with a suckling calf. Though he was from Ati clan but he refused to take the same name when he was in throne. He took up different name and title when he came up to his throne. The reason is detailed in one of the sections below for veiling of the original title. 1.2 Blessing of Rishi and Bappa Rawal’s Immortality! 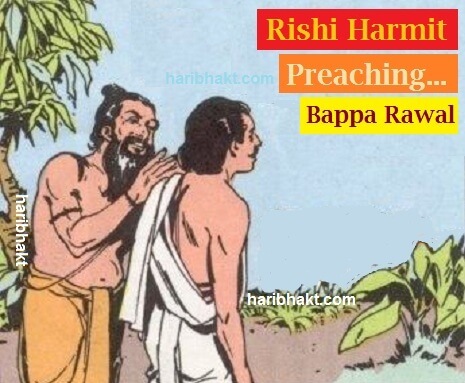 Bappa Rawal always respected and provided lodging for old hermits who devoted themselves to the cause of preaching knowledge of Sanatan Dharma (Hinduism), satsangs and bhajans. Several temples were constructed under his reign to spread information about Hindu dharma among youth of Bharat. An incident of his life is part of folklore – not verified by historians that Bappa Rawal married well over fifty women and had more than hundred children to increase royal Hindu population so that they become warriors and fight against any conquest of foreign invaders. Blessing of Rishi and Bappa Rawal’s Immortality! The Ekalinga Mahatmya and other bardic chronicles state that Bappa’s father Nagaditya and all other male members of his family were killed in a battle with the Bhils of Idar. He remained in disguise, accompanied by his two loyal Bhil attendants. He was brought up by a Brahmin woman of Nagda, who employed him as a caretaker of cows. Selfless caring of cows granted him karmic boon and he was fortunate to have a darshan of a Siddh Rishi. One day, he met the sage Harit Rishi. The sage agreed to initiate him into a Shaivite order (Shiv Bhakti), and to grant him immortality and supernatural powers. When Bappa reached the initiation site, he saw the sage ascending to the sky. The procedure was in a way the test of his Bhakti towards Rishi. Immortality and superpowers are bestowed after penance or complex test or both. Complete submission of mind is needed while chanting names of Bhagwan (Shiv or Krishn). The sage spit at him, and asked Bappa to receive the spit in his mouth in order to become immortal. Bappa hesitated in disgust, because of which the sage’s spit fell on his foot. Therefore, he could only obtain immunity from weapons instead of immortality. The ashirwaad of Rishi Harit with the blessed power of Shiv Bhagwan helped Bappa Rawal establish opulent territory. With this strength, he defeated his father’s killers, and established the Mewar Kingdom. Indologist David Gordon White notes that there is a similar incident involving the sage Gorakhnath and the Gorkha king Prithvi Narayan Shah, Gorakhnath spits yogurt into the king’s hands to make him a universal emperor. However, in confusion the king removes his hands, and the yogurt falls on the his feet, because of which he was only able to conquer the earth as far as his feet could take him. The 11th century writer Al-Biruni has also recorded a similar historical account involving the alchemist Vyadi and the king Vikramaditya. Every incident is part of Leela of Bhagwan, granting boon of immortality or super powers to rule the world to a single materialistic person could mean harm to the human race. 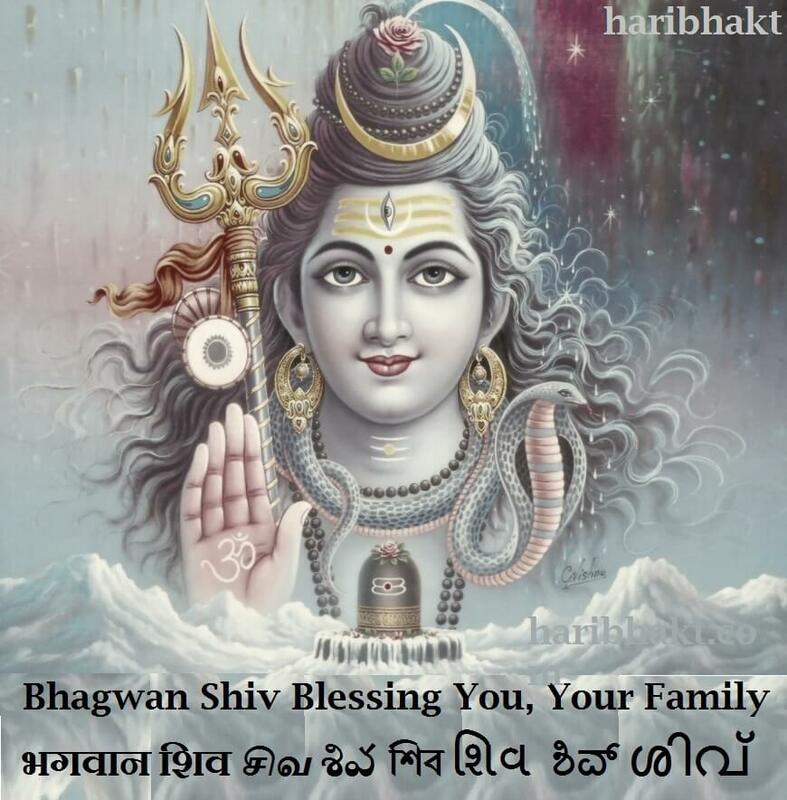 Bhagwan blesses the person with limitations so that balance is maintained and all human-beings however powerful he or she becomes after blessings do require support of fellow creatures so as to spread love, mercy and morality, this help in maintaining global peace.